This entry is part 7 of 9 in the series CheeseWeb Tastes Cheese. 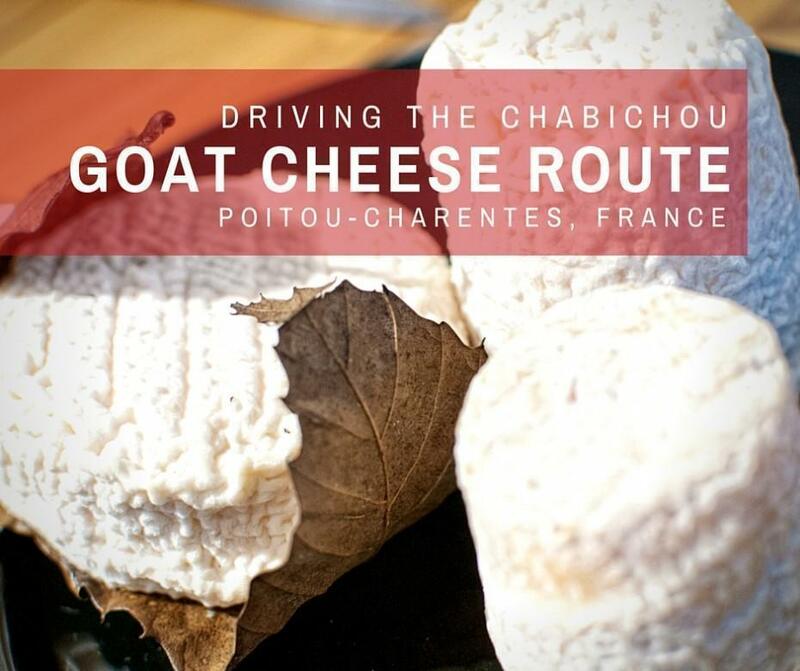 Two of my favourite things are cheese and goats, so when I learned Poitou-Charentes has a Route du Chabichou, dedicated to both; we had to check it out. While I don’t like to choose favourites when it comes to cheese, goat cheese is definitely high up on my list. I’ve visited a number of goat cheese farms in Belgium and I’ve tasted countless fantastic goat cheeses during our travels through France. During our day-trip to the beautiful village of Melle, we learned goat cheese or fromage de chèvre, is particularly important to Poitou-Charentes; so much so, one of their goat cheeses has an AOP designation and its own driving route, similar to the AOP Cheese Route in Auvergne. 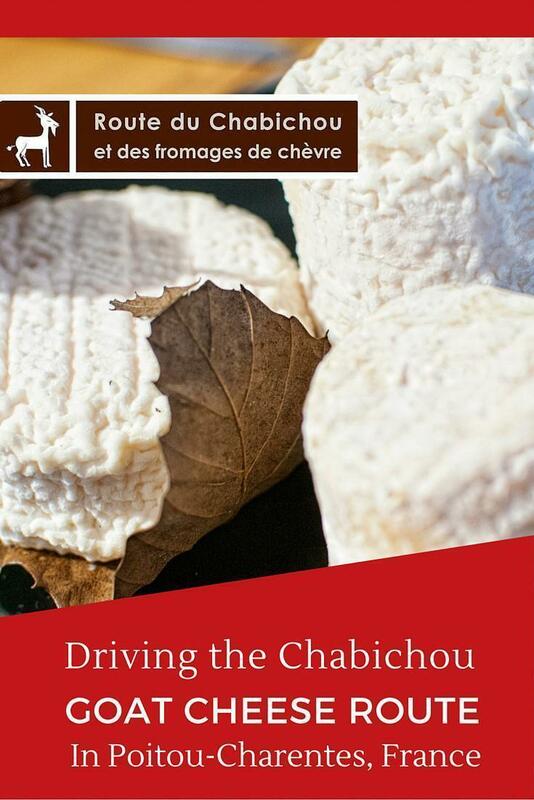 Chabichou (pronounced like shabby-shoe) is the king of goat cheeses in Poitou and the best place to begin a tour of the Route du Chabichou is the Maison des Fromages de Chèvre, in Celles-Sur-Belle. Anything named ‘the House of Goat Cheeses’ seemed like a good starting-point to me. 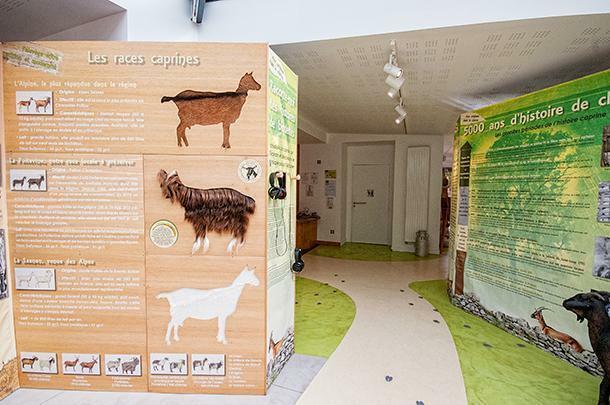 This bite-sized museum is dedicated to the long history of goat cheese in Poitou-Charentes. Farmers in Poitou have been raising goats since Roman times, but the popularity of Chabichou spiked in the late 1800s when the local vineyards were hit by the European phylloxera crisis. While goat cheese often comes from the mountains, as we saw at the goat cheese museum in the Dolomites, or drier climates where the pasture is insufficient for raising cattle, Poitou’s excellent pasture land makes for some very happy goats and some incredibly tasty cheese. After we learned about the history and manufacture of goat cheese in Poitou-Charentes, it was time for a taste test. 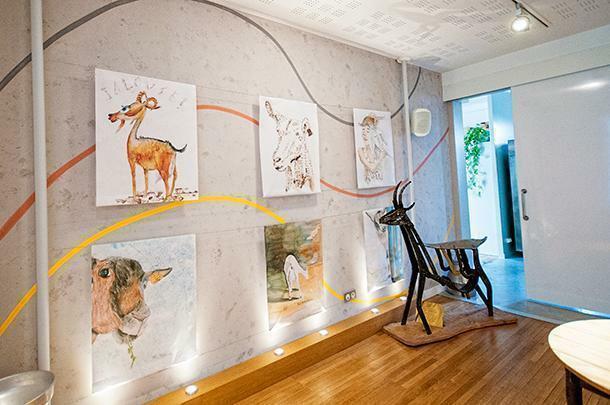 The tasting room in the Maison des Fromages sets the perfect scene, with its décor of goat-themed art. We began with the legendary Chabichou, a squat cylinder-shaped cheese with a rippled crust. Chabichou gained its AOP designation in 1990 and the fresh goat’s milk used for its production must come from a relatively small area south of Haut-Poitou: the south of Vienne, the Deux-Sèvres and the north of the Charente. Chabichou is aged for a minimum of ten days, but usually for several weeks. The younger Chabichou is bright white inside, with a creamy texture and subtle flavour. As it ages and loses more moisture, it hardens and the taste becomes sharper. The older Chabichou takes on characteristics similar to parmesan and we did end up sprinkling it on a variety of dishes, from salads to pasta, as we continued on our travels. 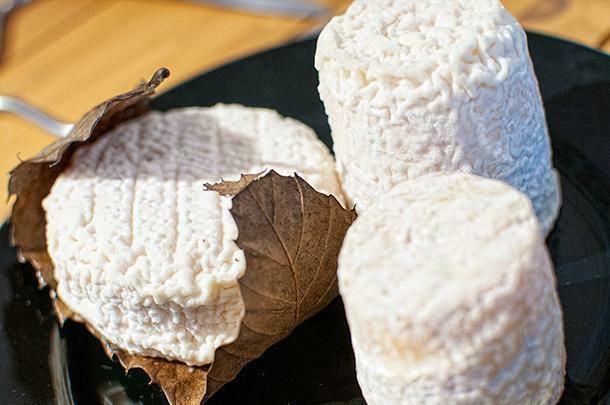 After sampling both young and old Chabichou, we moved on to another of Poitou’s special goat cheeses, Le Mothais sur feuille (Mothais on a leaf). This traditional goat cheese is wider and flatter than Chabichou. Its most important characteristic, however, is it is wrapped in a chestnut leaf and left to dry in humid conditions. Once ripe, the interior is creamy and smooth with delicate flavours from the chestnut leaf. Mothais sur feuille doesn’t have an AOP designation yet but it is undergoing the process. We hope to see this special cheese get the recognition it deserves. A final goat cheese, popular in the region, is Le Chèvre-Boîte du Poitou (goat cheese in a box). If you love Brie and Camembert, this is the goat cheese for you, as it is very similar in style as these cheeses from Normandy – but of course, it’s made from goat’s milk. 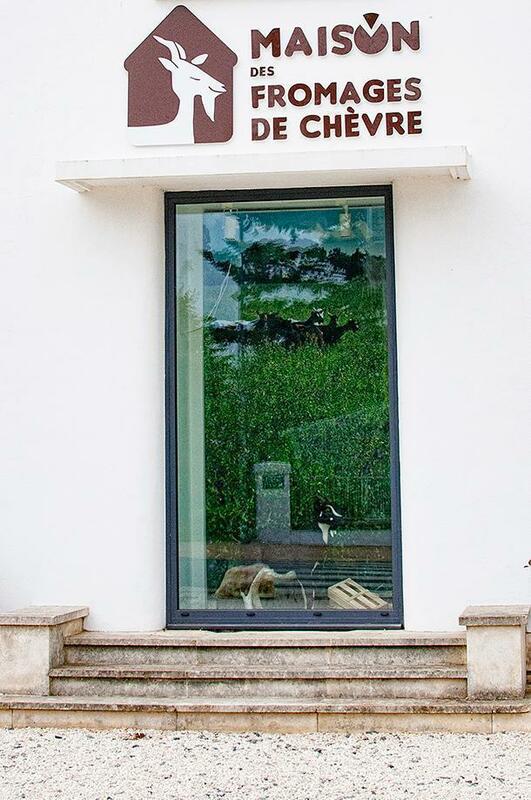 The Maison des Fromages de Chèvre has a small shop where you can purchase several of the region’s cheeses, however, the whole point of the Route du Chabichou is to get out and discover the goat cheese farms for yourself. There is a handy guide book (in French) available at the museum that lists 41 stopping points on the cheese route. As well as providing contact information and opening times for each location, the guide lists the type of production, the kinds of cheeses produced, the labels (bio-organic, AOP, etc), and what services are offered for tourists. A number of the farms are part of France’s Bienvenue a la Ferme scheme offering tourist accommodations, restaurants, and camping. Sadly, we didn’t have time to discover the Route du Chabichou in depth, (it is definitely on my bucket list to return), but we did want to stock Amelia with some of Poitou’s goat cheeses. We decided to stop at Fromagerie des Gors, in nearby Melle, as they were both bio-organic and AOP labeled for Chabichou. They are also one of the few farms producing Mothais sur feuille. We were surprised to find ourselves in a small business park on the outskirts of Melle, with nary a goat in sight. However, we spotted the brown Route du Chabichou signs, so we knew we were on the right track. 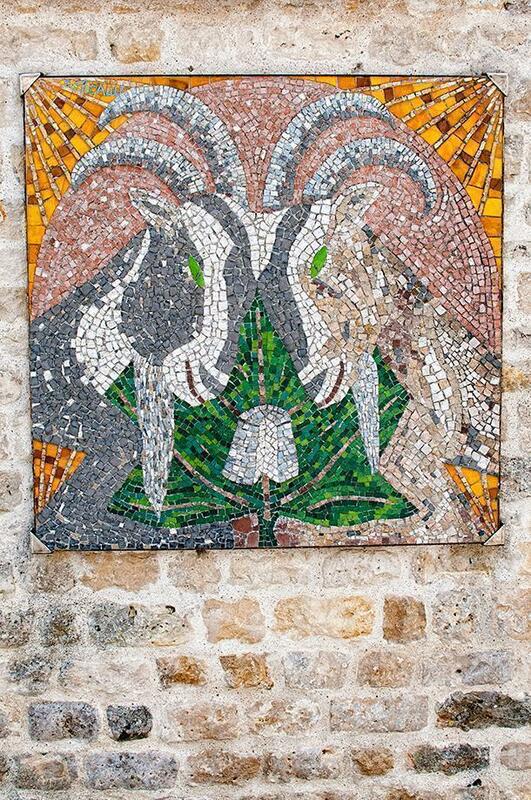 Goat art in Melle – How can you not love a town that has art dedicated to goat cheese? Rather than the farm itself, we found ourselves at the production facility, in a tiny unassuming wooden building (definitely not equipped with ample motorhome parking.) We popped inside, were warmly greeted by a lady in scrubs, who was busily packing cheeses, and asked what we would like. 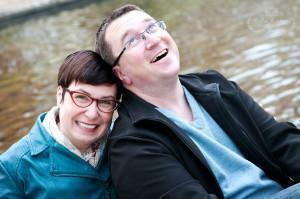 While we were tempted to answer ‘one of everything,’ we restrained ourselves… sort of. We stashed a paper bag containing a young and old Chabichou and a young and old Mothais sur Feuille in our fridge to enjoy later. And enjoy later we did. If you love French cheese and/or goat cheese as much as we do, don’t miss a cheese-filled road trip on Poitou-Charentes Route du Chabichou. We’d like to thank the staff of La Maison des Fromages de Chèvre for a lovely visit and tasting. Thank you also to the Région Poitou-Charentes Tourism office for hosting us in the area. As always, all opinions are our own.